The definition of what constitutes the best coffee maker may differ from one person to the next. For some people, it’s a machine that can brew quickly and for other people, it’s a machine that can brew large quantities. However, these are only 2-standards that a coffee maker can be judged upon. A whole lot of other features have to be taken into consideration as well. For instance, does the coffee maker maintain optimal heating temperature throughout the entire brewing process? Is it versatile enough to go from brewing just one cup to brewing an entire carafe and if it is, then how easy is it to use? Only when these questions are answered can it be determined if the coffee maker in question is the best. 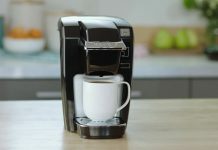 If you’ve been searching for a coffee maker that looks good and performs adequately, then the Keurig K475 Single-Serve Programmable K- Cup Pod Coffee Maker is a machine that wants your attention. This programmable system can be set to start coffee at a particular time and can be used with 3 different pods – a cup pod for a single serving of coffee; a mug pod to brew coffee for your travel mug or a carafe pod to make several servings at a time. It also has a large-sized color screen that gives you an opportunity to set brew strength, cup size, and temperature control. This coffee maker can be used with a variety of different K-cup brands which give you the ability to be picky about your brand of coffee. And while it’s somewhat noisy and the carafe has to be bought separately, it’s still a good coffee maker who like to take control of their morning coffee and make it the way they want it made. There are many situations in which you really don’t need the best coffee maker possible. Sometimes you just want to brew a quick cup of coffee without having to worry about navigating computer screens, pushing a bunch of different buttons or having to study a complicated manual. You just want something fast, convenient and inexpensive – something like the Black & Decker DCM600B 5-cup Coffee Maker. The fanciest thing about this coffee maker is its lighted switch, otherwise, it’s just your basic coffee machine. All that needs to be done to brew a nice pot of coffee is to add water, add a filter and coffee and turn the unit on. It then brews 5-cups of coffee at a time. It may not be as durable as other coffee makers, but it is one that definitely won’t bust the bank and has a compact design that’s perfect for use in a dorm or in an apartment setting. The Mr. Coffee TF5-RB 4-Cup Coffee Maker is a basic coffee maker that does one job and one job only – and that’s brewing a nice pot of coffee. It’s a machine that anyone can learn to operate and it’s pretty inexpensive as well. Which makes it a good buy for students or for people living on a budget. The TF5-RB doesn’t have all of the complicated controls that many coffee makers use today. All you have to do is turn it on and it will provide you with 4-cups of hot, delicious coffee. And if you need a cup before it’s done brewing, then all you have to do is take out the carafe and pour yourself a cup, the brewing cycle will pause until the carafe is replaced. Another great thing about this unit is its compact design. It’s small so it fits under just about any cabinet and won’t take up a lot of precious counter space. This makes it a great appliance for use in efficiency apartments and dorm rooms. The Hamilton Beach 48464 12-Cup Coffee Maker is an appliance that’s unlike most of the other coffee makers on the market. It employs an internal storage system that gets rid of the one part of the coffee maker that’s the most likely to break – it’s glass carafe. Instead, it keeps all the brewed coffee inside itself, keeping it warm until you decide to pour yourself a cup. While it’s enclosed water system is fairly unique, the rest of the unit works like most other drip coffee machines. You add the water, filter, and coffee and then select your setting: Bold, Regular or Iced. When all of that is done, it will then brew your coffee and keep it warm for up to 4-hours. With this coffee machine, you can enjoy anywhere from 1 to 12-cups of coffee without a whole lot of fuss or hassle. It seems to be a great machine for those people who just want to enjoy a nice cup of coffee without having to worry too much about how it’s made. The Cuisinart DCC-3200 14-Cup Coffee Maker is an easy-to-use coffee maker that allows you to make anywhere from 1-cup of coffee all the way up to 14-cups of coffee. Size isn’t the only thing you can customize with this appliance, however. It also has a full suite of controls that allow the actual brewing of the coffee itself to be tailored to your individual preferences. It can be programmed to go off during a 24-hour period and it has settings that control the glass carafe’s temperature – from Low to Medium to High. This allows you to use lower heat to keep your plain black coffee from scorching and a higher heat for your milk-based coffee specialty drinks. While this unit can brew just a plain cup of coffee, it also has a Bold setting that allows you to kick up the flavor profile of your coffee. It’s a nice coffee maker that just does the job it’s designed to do and that’s making a nice cup or carafe of coffee. For many people, mornings are the busiest times of their day. People have to get dressed, brush their teeth, eat breakfast and make it out the door so they aren’t late for school or work. Which is why it’s good to have a coffee maker that is fast and easy to use like the Hamilton Beach 46205 12-Cup Coffee Maker. This appliance has a number of great features which help people get their morning coffee made. It rotates to ensure easy access to the removable water reservoir and has a brew basket that pops out with the push of a button. After all, if you can get the coffee brewing quicker, then you can drink it faster. Other features that make this a great coffee maker include 3 brew-strength settings, automatic pausing of the brew cycle when the carafe is lifted for a cup, a programmable clock with 120-minute automatic shut-off and a non-stick warmer plate. When you first lay eyes on the Hamilton Beach 49976 Programmable Coffee Maker, it looks like two coffee makers that have been fused side-by-side. On the right side is a unit that can brew up to 10-ounces of coffee and on the left side up to 12-cups of coffee can be brewed. When making single-serving cups of coffee in this unit – either regular coffee cups or travel mugs – then K-cups are used. When making full pots of coffee, however, regular coffee grounds are used. It really gives the user some options when they are making their coffee. Other features of this coffee maker include a feature to adjust brew-strength, auto pause that allows you to take a cup of coffee without making a mess and a 2-hour keep warm cycle that automatically shuts off for safety. Coffee lovers who spend a lot of time traveling know how frustrating it can be to get that perfect cup of coffee. 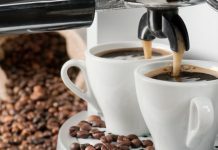 Half the times coffee machines in a motel or hotel room are either missing or are dirty, and hauling around a full-sized coffee machine can be a real pain. Fortunately, the AdirChef Grab N’ Go Personal Coffee Maker is there to provide a better solution. 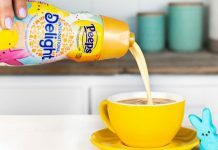 This brightly colored unit can brew a perfect cup of coffee either in the travel mug that comes with it and automatically shuts off after it’s done brewing. It also has an inexpensive and eco-friendly design that completely does away with paper filters. And since this unit only brews one cup at a time, it’s portable and can easily be placed into your luggage. It’s sure to become a good friend to the weary traveler. The Hamilton Beach 49980A 2-Way Coffee Maker is the best fusion between a full-sized carafe coffee maker and a single-serve coffee machine. On the right side, there’s a programmable system that can make 12-cups of hot coffee in a glass carafe. On the left side is a system that will make a 14-ounces of coffee in a travel mug or can be adjusted for a smaller coffee cup. Using this appliance you can set it to start brewing at a certain time and set a specific type of brew strength from Regular to Bold. This unit can also be used with regular coffee grounds or using a pre-flavored pod. It’s a great coffee maker for coffee lovers who want to be able to switch between making a single cup of Joe to a whole pot quickly and without additional equipment. The Moccamaster KBG 741 10-Cup Coffee Brewer is a machine that looks like it was not only designed to be the best coffee maker available but also to be the most beautiful. Its unique design doesn’t just make it look stylish, however. It also creates a process that makes a superior cup of coffee. It uses a copper boiling element that quickly heats the water up to the optimal coffee brewing temperature and keeps it there through the entire brew. It also features a precise drip-style system that ensures ideal coffee saturation time and makes sure that your cup of coffee has the perfect taste and aroma. The KBG 741 is also made of quality components and is designed to last a lifetime with proper cleaning and care – which includes descaling it on a regular basis. This stylish system will make a great cup of coffee within 6-minutes and will hold it at a precise temperature to keep it from burning. While this unit is usually more expensive than other conventional coffee makers on the market, it also does a better job of brewing a perfect cup of coffee. It’s not just a coffee machine but an entire brewing system that is designed to produce a perfect cup of coffee.